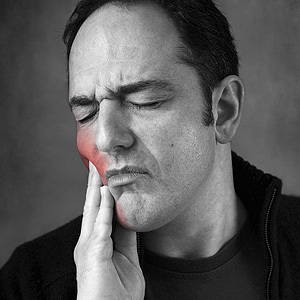 As many as 36 million adults in the U.S. suffer from some form of chronic jaw pain. What’s more, many of these may also experience other painful conditions like arthritis or chronic fatigue in other parts of their body. Chronic jaw pain is actually a group of difficult to define disorders collectively referred to as temporomandibular joint disorders (TMJD or also TMD). TMD not only refers to pain symptoms of the temporomandibular (jaw) joints but also of the jaw muscles and surrounding connective tissue. Most physicians and dentists agree TMD arises from a complex range of conditions involving inheritable factors, gender (many sufferers are women of childbearing age), environment and behavior. A recent survey of approximately 1,500 TMD patients found that nearly two-thirds of them also suffered from three or more related health problems like fibromyalgia, chronic fatigue syndrome, rheumatoid arthritis, headaches, depression and problems sleeping. The understanding of TMD’s connection with these other conditions is in its early stages of research, but there’s avid interest among healthcare providers to learn more and possibly devise new treatments for TMD in coordination with these other related conditions. In the meantime, TMD patients continue to respond best with the traditional approach to treatment, including physical therapy, thermal (hot or cold) compresses to the area of pain, medication and modifying the diet with more easier to chew foods. In extreme cases, jaw surgery may be recommended; however, success with this approach has been mixed, so it’s advisable to get a second opinion before choosing to undergo a surgical procedure. Hopefully, further study about TMD and its connection with other conditions may yield newer treatments to ease the pain and discomfort of all these conditions, including TMD. You can stay up to date on these and other developments for coping with the discomfort of TMD at www.tmj.org and through your healthcare provider team.